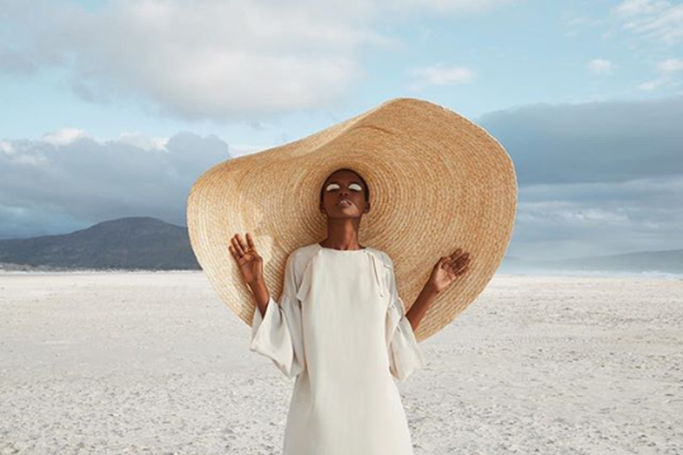 It’s going to be a summer of straw hats –according to Instagram, influencers and fashion editors, the wide brim sun hat will be the season’s must-have fashion accessory for wearing on the beach or in the city (in Dubai we do both). After Bella Hadid posed in Simon Porte Jacquemus’ outrageously big sun hat from his Spring 2018 line, the supersized hat became the next big trend to follow. Last year it was all about the basket bag, but the fabulously floppy sun hat has now become the accessory to swoon over this summer. So if you’re planning a holiday or need a stylish accessory which protects you from Dubai’s sunny days, then we’ve got supersized sun hat inspiration and a guide on where to shop the trendy straw sun hat in Dubai. Here’s a look at some of the quirkiest, prettiest and floppiest sun hats we’ve spotted on our Instagram feed –to inspire your summer holiday wardrobe or your next day at a beach club. Although we’d love to look like Bella Hadid in Jacquemus or Kendall Jenner in Missoni, those supersized sun hats are a little pricey.